We’ve all heard of incidents where the driver hasn’t seen something in his rear-view mirror when reversing. Even confident drivers can be deceived by what they can’t see from the driver’s seat. Whether driving in the driveway or on the road, driver blind spots are often the cause of accidents and deaths. Installing a reversing camera on your vehicles can prevent these types of incidents from occurring by giving you a wider view of what is behind your vehicle. No matter what vehicle you drive whether it is a Caravan, Truck, Trailer, Camper, Semi truck, Motorhome, we want to make sure you experience stress-free and enhanced driver awareness with our reversing camera monitor kit. Elinz does not just specialises, but also prioritises the customers’ safety, too, with our high-quality reversing camera system to be sure you can always get a great view at what’s behind your vehicle. With packages tailored to suit both application and budget, our products will help you drive more confidently by giving you an accurate wide-angle perspective. Depending on what vehicle you drive and with so many great options, it’s easy to get overwhelmed when choosing the right one. It's basically the type of wired connection, and the cameras we sell either have 4PIN or RCA connectors. The 4PIN cameras are great to use on vehicles like caravan, truck, trailer, camper, semi-truck and motorhomes. These are industrial-strength cameras that are built to withstand shock from heavy blows and suitable for more heavy-duty vehicles like the fork-lifts, cranes, mining equipment vehicles and other heavy machinery. The 4PIN connector is both locking and waterproof which makes it a very reliable, more secure and stress-free connection as you can power up the camera via the 4PIN plug from the monitor. Unlike the RCA camera, it needs to be connected to the reversing light for most of the setup. The RCA rearview cameras are a practical choice, and if kept dry, it is guaranteed trouble-free. Our reverse and rear-view camera image sensors are either CCD or CMOS. We offer two different technologies to suit your budget. However, highly recommend the CCD sensors as they provide a much higher image quality capturing images at higher pixel and with better colour. With CCD sensor cameras, you are always able to turn the camera on while driving and can last a long time. CMOS on the other hand, is a budget reverse camera with lesser image quality than CCD Reversing Camera. Our Wired and Wireless cameras are both reliable. They are also designed to make you safer while driving to ensure that you can always get a great view, depending on your preference. For the wired setup, you need to run the cable from the monitor to the back of the reversing camera. The wiring sends everything the camera sees directly to the monitor on your dashboard. A wireless rear view reversing camera won’t require you to run a long cable from the camera all the way to the display unlike wired one. Our 2.4Ghz Digital wireless transmission provides you with zero interference as compared to an Analogue wireless transmission which is prone to interference. If you're comfortable with auto electrical stuff, then installing wired or wireless camera kit should be no trouble at all. 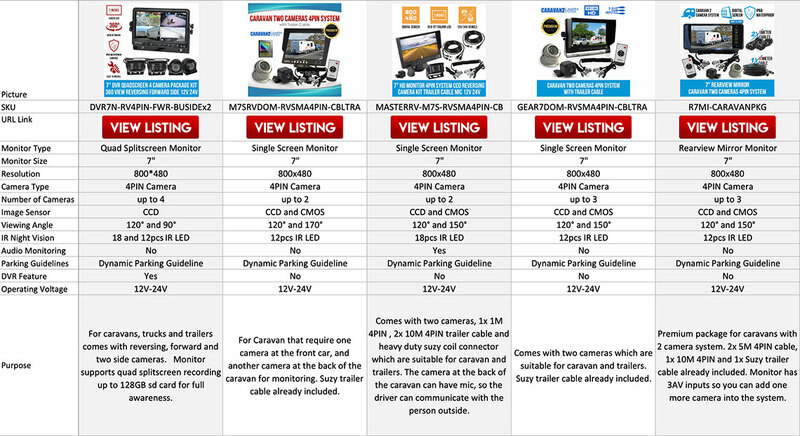 We have a wide variety of cameras depending on your budget and needs. Some cameras have a built-in microphone and they are very useful for reversing. Reversing will be easier and safer for having eyes and ears behind your vehicles. We have 4PIN cable with audio capability for camera with microphone to work with monitors with speakers. Parking your vehicle in a parking lot can be challenging, especially for a new driver, and many vehicles like vans and trucks don’t have rear windscreens at all. This is where reverse camera parking guidelines come handy for safe reversing. The cameras we offer have either fixed or moving guidelines. Once the vehicle starts moving, the rearview camera senses the movement and guidelines move to show the path of the vehicle. It simplifies the maneuvering in even the most complex situations. 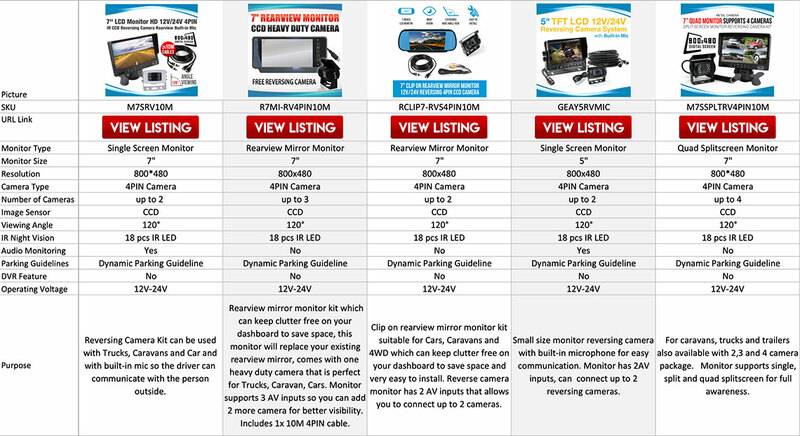 Depending on your safety needs and preferences, we have a wider range of monitors for you like the variety of Standalone monitors and Rearview mirror type monitors. A standalone reversing camera monitor has a larger screen and it provides a better view of what’s behind your vehicle. These are usually affixed to your dash board, or on windscreen with suction cups. Screen sizes are available from 4.3” which can display single screen to 9" that can show split screen of up to 4-pin backup cameras at the same time. Split screen monitors give you a complete view and the ability to assess the surrounding of your vehicle in real-time. This is not the same as the single screen monitor wherein you must use switching functions to show the camera image. We also have Wireless monitors, so you have options to choose from whether you want a single wireless camera, 2 wireless cameras for split screen or 4 wireless cameras for maximum viewing with quad split screen. Waterproof monitors are suitable for wet and dusty conditions found in industrial and outdoor environments. Providing protection from direct or windblown dust and rain, splashing water and snow are designed to meet all Australian weather conditions. Some monitors have DVR function, so you can record and save your recordings into a Micro SD card up to 128GB, and ready for playback which are perfect for surveillance. Mirror-type display either replaces or clips on to your factory rearview mirror which can result in a clutter-free and space-saving dashboard. They are ideal if you are already used to looking up at your mirror when reversing. AV Inputs refer to how many cameras you can connect to your monitor. Reversing Camera Monitor is an integral part of a reversing camera system allowing you to have full awareness of your surroundings. If you already have an existing reversing camera system and you are planning to add more cameras, you need to make sure that your monitor can support the added cameras. We have variety of monitors depending on the AV inputs. Some have 2x AV inputs whereas some have 3x and 4x AV inputs which allow you to connect to 4 cameras. Some of our reversing camera kits usually include one monitor and one reversing camera. So, if the monitor has three AV inputs, you can connect two more cameras on top of the one camera that already comes with the package. For larger vehicles like trucks and trailers, we recommend adding side cameras to maximise your awareness. If you are towing caravans, you are required to have 2 Inputs: one camera for the back of your caravan, and the other camera at the back of your car. Enhance your safety and check out our reversing camera monitor kits that are great in providing you with full awareness, whether you’re trucking across the country, or you’re towing a trailer, horse float, caravan or boat. 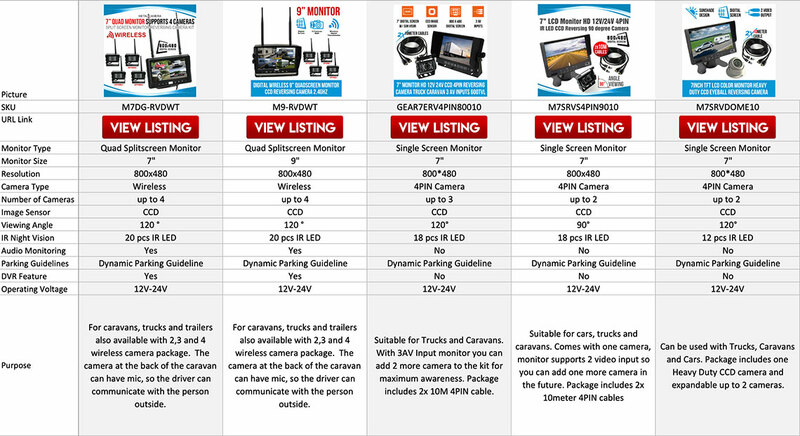 4 camera monitor packages are complete with side cameras, front and rear cameras. They are suitable and highly recommended for buses, trailer trucks and more. Some can also use this for farm, harvesting, mining, truck, crane, forklift and other heavy equipment’s. The kit comes with heavy duty trailer cables that allow your monitor to power up your cameras, no need to connect to another power cable, and some, with suzi coil trailer cable. The connection between your truck and trailers is very important, and this is also a common electrical fail point. By using our quality Suzy coil trailer cable, you can reduce electrical faults and downtime. We offer high quality and affordable price that best to suits your budget. These cables provide easy connection between vehicles and trailers. It carries audio, video and power, and is available in 1, 2 and 3 channels. This is a perfect must-have for trailer trucks or hauling a fifth wheel or caravans, it comes with caps to keep the connection dry and safe ready for the next use. Heavy Duty cameras have a good combination of width and distance viewing. CCD imaging sensor provides better picture clarity and sharpness. It is also built with IR LED to show clear images in low light especially at night. Industrial strength rear vision equipment is built to withstand shock from heavy blows. It also functions in all Australian weather conditions. Options include 5M, 10M, 20M 4PIN cables and Wireless, with or without microphone for audio functionality. These cameras also feature 90 to 135 degree viewing angle field of vision. Side View cameras are compactly designed to provide better view especially for bigger vehicles like trucks, trailers, buses, caravans and other vehicles with lots of blind spot. Some modern vehicles already have side cameras installed from the factory, and some are still not enough to provide full awareness and visibility preventing accidents while reversing or parking. Side view cameras expand your rearview system to see pedestrians, cyclists and obstacles. Most cars already have a small removable piece which can be mounted, too. For older vehicles, we include a drill bit for a sleek, inconspicuous and flush installation. Options include CCD or CMOS imaging sensor with 90 to 170 degree angle field of vision. These backup cameras are as small as an ice cube. Installing them will prevent your car from having scratches or dents on the rear bumper bar or license plates.